It is true to say that the subject of soap dishes is hardly the most exciting of topics for a blog, but these domestic items do deserve a mention.While this modest vessel is often a boring mundane feature in most bathrooms there are some notable exceptions. If your taste is for semi-precious gemstones then look no further than Mike and Ally who offer a selection of bathroom accessories in lapis, amethyst and flourite. These gemstone pieces are quite unique as each is made from hewn stone and with no 2 pieces the same, this brand delivers one of a kind soap dishes with every dish having a distinctive pattern of veins and hues. Mike and Ally also offer a range of precious metal accessories in polished and matt gold and silver. While we do not offer our Ergo or Morphic bathroom collections with gemstone we do think they can be considered as hidden gems that will surprise and delight family members. We usually cast these collections in 316 stainless steel a corrosion resistant and highly durable alloy which can be polished to a high luster or brushed for a satin finish or for the ultimate in sophistication, finished in two-tone polished/satin. For a warmer appearance these pieces can be cast in silicone bronze an alloy that is also corrosion resistant but one that will change color as the metal develops its own natural patina. One reason to choose soap dishes made of gemstones or cast in solid steel or bronze is that both will endure the test of time and neither will rust so can be kept as timeless gems to beautify your powder room or master bathroom. How the handing of a door can affect the aesthetics of your door pull. The handing of a door is not something you would necessarily consider when ordering your door pull or grip especially when they are to be mounted as a pair of back to back handles, but the handing does impact the security and beauty of the door handle set. How to determine the handing of your door? This is not hard, simply look at your door from the outside, if the hinges are on the right then your door is right handed and for a pair of back to back handles this would mean the handle on the outside would be right and left on the inside. When we are preparing a left and right grip as a back to back through bolted set, we machine the grips so that a threaded bolt can be screwed through the face of the grip that is on the inside of the door and pass through the doors core and into the threaded hole in the back of the grip on the outside. The bolt on the inside will be counter sunk and concealed with an attractive screw cap but the handle can still be removed by unscrewing the bolt, so it is wise to have the bolt accessible only from the inside. By comparison, the bolt on the outside handle is only screwed in sufficiently to make a strong connection, typically about ½” into the back of the pull and cannot therefore be unscrewed from the outside. Through bolting a door set makes for an easy installation and one that provides a very solid connection for your door handles. In a later piece I will compare different surface mounting techniques. In the photo of the Ergo heroic handles these have been mounted on a pair of doors (double door). From a handing perspective you have 2 doors, one is left handed, the other is right. If these had been installed with a locking mechanism, then for clarity one would call out the door that has the lock as the “operational” door. Having hunkered indoors to avoid the torrential rain we were finally able to take a refreshing walk in the Hollywood Hills and discovered some trees and bushes that are already blooming including pink camellias and golden mimosas. Living in this exceedingly temperate climate we also have plants that can bloom at any time of year as their reproductive cycle occasions. 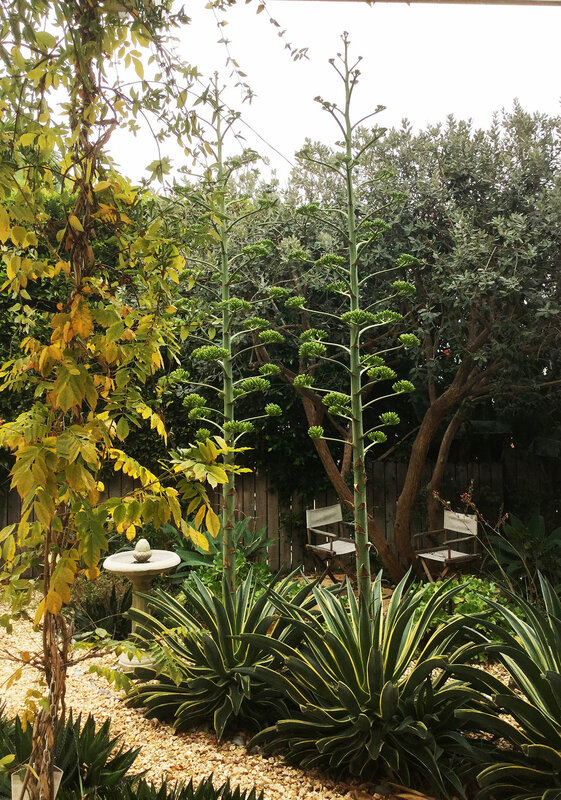 A spectacular example can be seen in the desmettiana green and yellow agave that we planted back in May 2016 when we turned our garden from being a sad lawn to a water tolerant stunning landscape. Just under 3 years later the desmettiana cuttings have grown to am impressive 12’ in height and have thrown up sculptural asparagus spears that have just blossomed into fleshy yellow flowers. What is beyond my comprehension is how this agave giant has grown to such height and girth with minimal water and no added nourishment. The spears began to shoot up before we had seen the recent rains showing us these plants true mettle. The pollen is hidden deep inside the flower at the base of its stamens making it accessible to only the most tenacious bees and hummingbirds, the latter being suitably equipped with long beaks and even longer tongues. Whether it be the guests’ powder room or the master bedroom spa choosing a unique soap dish or intricately detailed towel rail can finesse to even the smallest space and can make a striking addition to even the most modest bathroom makeover. While this custom towel rail was designed to be used in an opulent yacht setting, by choosing a nature inspired design and a more rustic bronze medium this unique towel rail is both modest and luxurious. Had this piece been rendered in polished bronze the appearance would have been garish. Polished towel rails and other bathroom accessories do have their place in any bathroom makeover but consider using a more sophisticated two-tone finish such as the one used below on the Ergo towel rail where the polished facets are softened by satin finished contours. The effect is labor intensive requiring each piece to be firstly hand polished and then masked so that the contours can be subdued by hand brushing, the result though is a subtle and very tactile towel rail. Our contemporary bathroom accessories in both the Ergo and Morphic collections are typically ordered in stainless steel a medium that plays well in any contemporary bathroom makeover. By comparison the more classical Hedgerow and Willow towel rails and soap dishes are used in both transitional and rustic bathrooms. That said the Ergo style can work equally well when cast in bronze and finished with an oil rubbed antique patina which gives it a more arts and crafts appearance. We have just changed our profile photo to a collage image of colored door handles taken from our Morphic and Coral styles of door hardware. Our illuminated handles began with the introduction of low voltage LED lights into our Morphic cylindrical handles. To do so we had to solve the problem of how to incorporate a hard wired LED spot into a cylindrical handle the smallest of which has a mere 1.25” internal diameter. As the cylindrical handle is vertical and as the design is open we could not use a strip of LED lights but needed to work within the confines of a small downward projecting light with a narrow 10 lens that would center rather than diffuse the colored beam. The cylindrical handles range from 16” to 32” in length and are available either with a single color constant voltage LED spot with built-in driver or a color changing constant current spot. The profile collage also shows the illuminated Coral handle which is one of 3 panel style door handles These are also color changing handles but are lit using multiple diodes encapsulated in a weather proof flexible strip that fits into the inner perimeter of the handle. Both types of door pull are made using the lost wax method of casting and are available in bronze or stainless steel and are UL listed. Our new illuminated door pulls are hard wired and not battery dependent and I was recently asked how this impacts the type of door chosen. For some time door lock manufacturers have been making electric mortise and deadbolt locks that can be powered by low voltage wires that release either the bolt or the strike and often this is done by a remote controller. One of the easiest methods of supplying power to the door is through an electric door hinge. Power coming from a low voltage class 2 power supply is delivered to the door jamb into the fixed section of the hinge. The wires then pass through the knuckle or center section of the hinge and on to the operative part of the hinge which is attached to the door itself and which pivots the door open. Electric hinges have the advantage of concealing the wires used to power door handles and locks and most can be ordered for these low voltage applications. A concealed door loop like the one by Command Access is a low profile alternative to the electric hinge and one that can be freely positioned anywhere on the jamb. While its unobtrusive design and size make it attractive you will still need a hinge to open and close the door. If you are looking for an equally discreet electric hinge you may want to consider the hinge options from Simonswerk.com who offer some very sleek concealed hinges that function in the same way as the surface mounted version but are recessed and flush with both the door jamb and door edge. These hinges will require a reasonably solid outer door edge that can be routed out for the hinge plate. Off course the power can always be supplied through a surface mounted conduit or metal arm which may be an option for commercial projects or areas where the reverse side of an entry door is less visible. To power the LED handle the wires from the handle will have to be routed through the door and connected to the power that is being delivered to the door jamb. Provided the door has a hollow frame this should be relatively easy as the cables are small 22 gauge wires and can be fed through a channel in the door frame. The top and bottom door rails for hollow metal doors will often have a separate cover that can be attached after the wire conduit has been fed through. In summary your door will need to have a hollow outer frame or pre-made channel designed into the construction so that cables can be fed through to the illuminated handle. The channel can easily be incorporated into the construction design of the door and major door manufactures are already doing this so that the consumer can remotely open and lock the entry door using a remote controller to activate an electrically powered lock. While there is a reasonable amount of door hardware that meets the legal requirements of the ADA it is often challenging to find artistic door handles that satisfy both the artistic and physical needs of any one client and their designer. The Ergo collection derives its name from the adjective “ergonomic” being a design that is optimized for easy use in the workplace and when it was created, Martin Pierce developed a left and right knob and lever design with suitable cut outs and indentations that could be easily gripped by a left handed or right handed person. The style has evolved over time with modifications being made to slim down the lever for more universal comfort. Though the Ergo series is ergonomic, not all pieces are ADA suitable. As we grow older our physical needs and challenges multiply but not in a homogeneous way so a generic approach to making hardware ADA compliant is no guarantee that the adapted hardware will work for all. Enter a skilled and sensitive designer versatile in specifying custom door hardware like Lambrino Christoff of Barton G Design. With Lambrino’ s input we recently re-designed our Ergo epic cabinet pull by scooping out the back to make a hollow that could easily be gripped using ones index and middle finger. See the image below showing the evolution of this piece, the middle picture shows the custom piece and the top and bottom pictures show the first and most recent cabinet pull in this collection. For other designers we have modified our Ergo cabinet pull making the mounting posts taller thereby creating more space between the cabinet face and underside of the pull that can be gripped by several fingers together. The creative process is as unique and unfathomable as the brain it resides in. When I have listened to authors and composers answering the question of where and how they get their inspiration there appears to be a myriad of sources. The same holds true when it comes to designing door hardware and Martin Pierce’s designs reflect the eclectic nature of his source material ranging from oceanic shapes to tree bark and bird wings to name just a few. As a result, Martin always has a sketch book on hand to doodle in his designs as they occur to him but a large number of his designs also come from a more structured and practical need either to develop additional pieces for a popular collection or to meet a designer’s need for a specific project. Not all of the designs make it off the drawing board and indeed I would hazard a guess that less than 10% make the leap. When designing a new piece there can be as many as 4 or more alternatives that materialize on paper and if the project is commissioned by a designer then alternative concepts can be useful in hammering out practical site issues or scale questions. We keep all of these sketches as source material for future designs and this is how I came across some of the leaf designs shown here. The Willow door pull came from a need to create a flush pull and resulted in 3 designs one of which is currently in used in Willow collection. The leaf hinge design is still in the design stage where it will remain until we have sufficient hinge designs to complement our other collections. The Vine collection is a popular series and the new leaf and grape design shown here is already taking shape as a sculpted wooden pattern. We are frequently asked to make one of a kind door handles for designers looking for a statement piece for a restaurant or retail project or corporations looking to expand their brand presence. The requests we receive can be challenging and some, such as a request for rotating human hand, border on the bizarre. As a company we do a lot of custom casting but the process we use to create our work is costly and does not lend itself to value engineering. The focus of this article is to outline the process with the aid of photographs taken during the creation of a wine cellar door handle, commissioned by a client as a limited edition. As designers we truly respect the creative process and understand the time that goes into creating a unique piece and accordingly will only work on projects that are free from plagiarism. 1. Concept drawing(s) often several form the starting point to a dialogue where we establish the size of the handle, whether it needs to operate a latch or is to be used as a stationary grip. 2. Perspective drawings are detailed drawings that show the client how the piece will look when viewed from different vantage points. We need to understand if the piece is being viewed from all sides as it would be if used as a grip mounted on a glass door. How the piece is to be mounted either by through bolts or surface screws will need to be decided and drawn. A three dimensional pattern is created in wood or if the piece is small, typically less than 3”, then in solid wax. At this point 3D printing is slow and expensive but it can be useful if one is creating a mirror image of a simple shape especially when the shape is symmetrical. We used 3D printing when creating the simple gourd shape for our Dragon Egg Sconce. For larger detailed and organic pieces Martin Pierce carves the pattern by hand. He uses a reductive approach to whittle down his over-sized block of wood to create the pattern. Other pattern makers use an additive approach and they create the pattern by adding and forming pieces of clay. In our case study the design required 4 patterns to be carved, a left and right facing waiter and their two goblets. The patterns took many hours to create but by carving the pieces with an array of different chisels Martin could create a very detailed fine pattern and one whose details could be captured in bronze. Each pattern requires a mold and if the piece has a lot of undercuts it may require a 2 piece mold. In this instance we developed a total of 4 two -piece molds each one made to encapsulate one of the 4 patterns. The molds are made from building up successive layers of silicone rubber that pick up the fine detail of the pattern. The pliable nature of the rubber is then reinforced by an outer casing made of plaster or metal which holds the 2 parts of the mold in place so that they can withstand the pressure applied when molten wax is injected into the cavity. The cavity is created when the pattern is removed from the mold and to make this easier the pattern is coated with a release agent before the rubber is applied. Casting – what is meant by lost wax? For every piece we cast in bronze, we first make a wax replica by pouring molten wax into the cavity of the mold. Theoretically these replicas could be 3 D printed but at this point the process is slow and expensive. Depending on the size and cooling time it is possible to make multiple waxes in a short period of time. At this point the channels that will be needed to supply the molten metal and those that are needed to vent the air created by flowing metal are added in the form of sprues and gates. The wax replicas are then “shelled” and dipped into successive coats of liquid silica to build up a thick outer shell. If the shell wall is not sufficiently thick then it may well fail when the bronze is eventually poured. For large castings the shelling process can take weeks but it is a critical step that determines the success of the casing. After the wax has been shelled the wax will be removed in an autoclave steamer that essentially steams or heats up the solid shell so that the wax is evacuated or “lost”. The hollow shell or ceramic case is then fired and is ready to receive the molten bronze. Once the casting has cooled all the sprues and gates will be ground off and the casting will be groomed with metal files to remove any casting imperfections. The casting will then be machined for mounting bolts, latches or other locks that it will be used with. The casting is then ready to be finished. In our case study we applied 3 different types of chemical patina and re-burnished key areas so we could delineate the writing on the goblet and the waistcoat buttons on the waiter’s jackets. We have named our recent wall sconce Dragon Egg as we were riveted by the special effects and scenery of this show but this was a tongue in cheek naming and while the gourd shape may be egg like the texture of the piece is not. The custom sconce started life in Martin’s sketch book and went through several design modifications before being created as a three dimensional piece. In this and in the next few posts we will be looking at how our new LED wall sconces and illuminated door handles came to life. The Dragon Egg sconce took its direction and feel from our Morphic custom door handle collection, which was based on coral and other oceanic forms. Martin began the design by deciding the overall shape and settled on the gourd. He then focused on the characteristics of the open area and moved away from geometric shapes to a more random and sinewy look. The LED spot shines down through this open area and creates a beautiful fragmented light that you will be able to see soon to our upcoming sconce video. How did we then make the pattern and subsequent castings? From the design shown in item 4. below a full scaled drawing of the gourd was created and a large 20” cube of alder was slabbed together and glued to create the “blank” for the pattern. The blank was then turned on a wood lathe to create the gourd shape. As a wood carver and turner it is easier for Martin to create patterns using these older skills then to digitally create a 3D model. However from this stage onwards we worked using 3D printing technology in conjunction with carving to create the final pattern below. The initial alder gourd was scanned and then its surface area was mapped digitally. The programmer then digitally hollowed out the interior of the gourd shape leaving a wall thickness of 3/16” and went on to print this as a resin model. Martin then drew his sinewy design onto the resin gourd and using a dremel tool followed the contours of the sinews and ground through the resin wall to create open areas for the light to pass. Before the advent of 3D printers, Martin would have created the hollow gourd from solid wood and the inner material would have been carved out using a variety of hand chisels. While 3D printing is a big aid to pattern making, carving is still Martin’s preferred technique for complicated irregular shapes and for adding design details as these can often change as the pattern is developed. While we make all of our unique cabinet pulls to order, some of our designer clients plan ahead and use our unusual cabinet knobs as a special Christmas gift or even as stocking fillers. The pieces shown here have been used in this way and we also have been known to use the smaller items on Christmas Day when sharing the Secret Santa game with our neighbors and friends. We have also used our leaf cabinet pulls as a decorative detail this year to create a festive wreath for our digital Christmas Card which we recently posted. Not all trees lend themselves or rather bend themselves to work as luxury door handles so when creating a tree door handle we use considerable artistic license. With our Hedgerow design we blended several different trees and tree parts. Which trees inspired us? I am reluctant to name any one tree in part because this iconic design reminds different designers of different trees but also because the design came from Martin’s imagination and not from studying any particular tree. So, if the handle reminds you of a California Cypress or gnarly wild oak or even of a Bunyan tree, then you are right. We are in the process of adding different finishes to the Hedgerow tree and as you may know from previous posts are also developing a new tree design which if all goes well will be lit with interior LED diodes, so please do follow our post for progress reports. As with the Hedgerow heroic handle, while the new design is instantly recognizable as a tree the family it belongs to is imaginary. The canopy of the Hedgerow tree shown above flows from the trunk of the tree and it is pitched and so that the back of the canopy lies flat and flush to the front of the door. The tree handle is attached to the door by through bolts that screw from the inside of the door into the back of the canopy. The gnarly Bunyan reminiscent roots also flow from the trunk and similarly have a flat back where another though bolt supports the hefty handle that is cast from 10lbs of solid bronze. As many of you know Martin loves reptiles and insects but he also loves mammals and this extends to bats which are found in his collection of animal cabinet pulls. For some reason I do not think of bats as mammals and see them as flying rodents and indeed if you look at many bats they do appear to be rats with leathery wings. When Martin and I were in Belize several years ago we stayed at the luxurious Blancaneaux Lodge, a Coppola resort and took a guided excursion by canoe to Barton Creek Cave. The ancient Maya once used this cave as a burial site and the interior is filled with spectacular stalactites and stalagmites and a thriving bat colony.The ceiling of the cave was fairly low so with our head held flash lights we could see the fine details of the bat faces and their fury bodies as they hung from the cave ceiling in clusters. More recently, in Paso Robles, in the hot month of August with the doors open to cool the house a large bat with a 16" wing span flew into our bedroom. After much flapping the bat tired and so Martin was able to carefully hold the bat by its wings and emboldened by his action I stroked the incredible downy coat of its fur and touched the soft fine translucent leathery skin of its wings. Respecting the bats right to peace we turned all the house lights off and released him back to the night. For those bat lovers out there is a great YouTube page where you can see a bat rescue center in Australia with some adorable bat videos. 1. How many doors are you planning to re-furbish - is this a statement piece for an entry door or are there several doors where you will be using the same style of design? 2. How eclectic are you? Do you like to continue a particular style through the entire home or do you like to mix and match styles? 3. Is the door exterior or interior - if an exterior door, is it protected from the elements or will it be exposed to rain, snow or sea spray as these will contribute to the corrosion and rust of the handle. While bronze does not rust, it will over time develop a patina and is often referred to as a “living finish”. Stainless steel is corrosion resistant and while not rust proof, 316 stainless steel is the preferred alloy for coastal properties exposed to sea water. 4. Does the door need to lock - and does the door handle manufacturer provide the handles you are considering for all types of function from locking front and privacy doors to non-operating "dummy" handles that are typically fixed and often used to complete the symmetry for example of double doors where one handle operates to open and close the door and the “dummy” handle is used more as a grip or pull. 6. Are your doors unusual - are they extremely deep or shallow, bare in mind that a typical door in the US is 1 3/4" to 2" thick and while many handles can accommodate other depths, the manufacturer may have an up charge to create shorter or longer spindles or through bolts. 7. Unforeseen charges to consider - the lock is often not included in the cost of the door set but this varies with manufacturer, for example we do include the costs for tubular latches but not the cost of the mortise lock made by Accurate. The installation of a door set, particularly one that locks, will need to installed either by a contractor or locksmith. When planning to remodel a room many of us begin with the color scheme and build our design from there. While this is admirable it may also unwittingly turn us into trend followers. So what other approaches are there? Much will depend on the scale of the makeover, is it the entire home or is the scope limited to the social areas of the home such as the dining and living room, or the more personal areas like the master bedroom and bathroom. For the purposes of this piece I will focus on the dining room. As mentioned in a previous post, both ends of the age spectrum from the millennials to the baby boomers are moving into smaller homes and making use of more flexible spaces. Hopefully, the dining room as a place to relax and enjoy meals with friends has not fallen victim to this scaling down and still exists as an area demarcated from the rest of the home. If so, look at the furniture and determine whether it can be revived. As furniture makers we are fortunate in having chairs that we made from solid walnut and that were intended to last if not forever, at least for a few lifetimes and that have over the years been easily revamped by new upholstery. If your chairs are worth saving and are made of solid wood or metal then they can be revived by re-finishing the frame and by re-upholstering the seat or back. If you live in Los Angeles you should have no problem in finding a furniture finisher or upholster but if you are not familiar with how to order fabric what yardage to use, or footage to buy if using hide, then I strongly recommend working with an interior designer. The designer will be able to guide you through the maze of questions about which fabrics need to be backed, how much fabric you will need depending on the pattern repeats of the fabric, whether the chairs should re-sprung and if so whether coil and spring is a better option for your chair frame than webbing. The dining room can also be remodeled by focusing onbuilt-in cabinets. Built-ins are a common feature regardless of the age of the home and can be revived by re-painting or re-varnishing the doors and frames or by removing the doors to create an open cabinet either with or without shelving. This is how I plan to revamp my dining room and to add the defining touch I will be replacing the cabinet knobs. We were recently featured in the Los Chapter of the ASID magazine and want to share with our readers the benefits of working with a creative designer, like Bonnie McIntyre. Working with a professional designer is especially important when a home owner is choosing custom door hardware for their existing home that needs renovation. Bonnie began the project by reviewing Martin’s wide range of hardware designs and assessing each style as to its scale, design aesthetic and compatibility with her client’s existing front door. The client, a keen birder, loved Martin’s woodpecker door knocker and so Bonnie continued this natural theme by taking the bark texture of the mounting plate for the door knocker and using it as back-plate for the door set. The result of this collaboration was a custom one of a kind willow bark door set. The Willow series was continued into the renovated kitchen where Willow cabinet knobs and Hedgerow pulls were nickel plated and gently oil rubbed with a dark patina to create a sophisticated finish and one that paired well with the pewter faucets and steel range. The transition from the kitchen to butler’s pantry and then to the breakfast room was a point of departure and here more whimsical bunny knobs were used for the passageway doors. While the project was very satisfying to all who were involved, had it not been for Bonnie McIntyre’s creative restraint and her amazing eye for the smaller finer details I do not think we could have created a space that was both sophisticated and soothing. We have added a new cabinet door pull to our animal and bird collections and have used the inspiration of Hawaiian birds and fauna to create this piece. The pull is substantial in scale measuring 12” high and 3” wide and can be used either for large cabinet doors or for interior doors. It is cast in solid bronze and made using the lost wax method of casting which allows us to achieve incredible detail and fluidity in design that is difficult to achieve by other casting methods. The pull is a fusion of bird, vine stem and even human features all of which flow together to create an abstract mythical piece. The pattern for this piece was sculpted in wood and was carved as a 3 dimensional sculpture, both sides having the same design. In the picture we are showing 2 pieces and by turning the piece over we are able to create pulls that are the mirror image of each other. The mounting posts are attached after the casting has been made and so on this occasion we were too able to create a left and a right pull using one pattern and one mold. We have named this new addition the “Grand Hawaiian” pull to distinguish it scale wise from the single and double-headed bird pulls in the same collection. If you are looking to use other Hawaiian inspired cabinet pulls we also have an orchid stem and bamboo design to complete your tiki dream room. One of the more popular lines of architectural hardware at Martin Pierce Hardware is our Morphic collection. One look at the sleek design and interesting texture of these pieces and it is easy to understand it's popularity. On our website we describe it this way: "Fluid contemporary designs are the basis for this innovative style of decorative door hardware. Cast in steel, these hardware pieces are extremely contemporary but when cast in bronze the effect is reminiscent of the Art Nouveau style." or an LED lighting feature that will be debuted at this years HD Expo in Las Vegas, Nevada. This collection also underwent some color and form changes for the new Baha Mar Resort in the Bahamas. More on this exciting project to come. To view the entire Morphic and other collections of custom hardware, please visit our site at www.martinpierce.com. It is hard to believe that the 2015 HD Expo is exactly 60 days from today! The first quarter of this year has just flown by what with preparations for the Expo as well as working on other projects. We have been assigned our booth location. You can find us in booth #2277 in the Exhibitor's Hall. We are excited to share with you some new products (more on these later) as well as display some of your favorites from past shows. Suffice it to say our Morphic Heroic door pull has undergone some amazing changes! As we have done in past shows, we will be awarding to the first ten visitors to our booth one of our silver plated orchid cabinet knobs. Pretty and feminine and wonderfully detailed, this knob will add an elegant touch to your home or office. And be sure and check out our new lighting collection that we are debuting at this year's Expo. Game of Thrones fans will enjoy the new designs. To view many of our architectural hardware collections, please visit our site at www.martinpierce.com. We recently announced that the first ten visitors to our booth in the Exhibitor's Hall at the 2015 HD Expo will receive one of our exquisitely detailed silver plated orchid drawer pulls to use as they please. In 2014 we awarded twenty lucky visitors to our booth their choice of either the whimsical dragonfly pull or our small scarab beetle pull. The spring of 2013 found us delighting ten lucky winners with our beautifully detailed butterfly pull. Our new at the time bronze daisy pull was chosen as the giveaway for the 2012 HD Expo. And it all started with the fun polished brass frog pull we awarded to the first ten visitors to our booth during our inaugural visit to the 2011 HD Expo. Were you one of the lucky winners? To view all of these items or our entire collection of architectural hardware, please visit our site at www.martinpierce.com.